You are currently viewing all posts tagged with edc. I carry a spare tube underneath my saddle. With my Schwalbe Marathon Supreme tires I rarely get flats. When I do, I usually prefer to use a patch, but sometimes you need to replace the tube. To protect the spare tube from the elements – UV rays, abrasion from dirt, etc – I wrap it like a burrito in a piece of black Tyvek. This is then stuffed underneath my Brooks B17 and secured to the rails with a 12” nylon buckle Voile Strap. The package is easy to get to when I need it, doesn’t move until then, and isn’t very visible unless you’re looking at it. 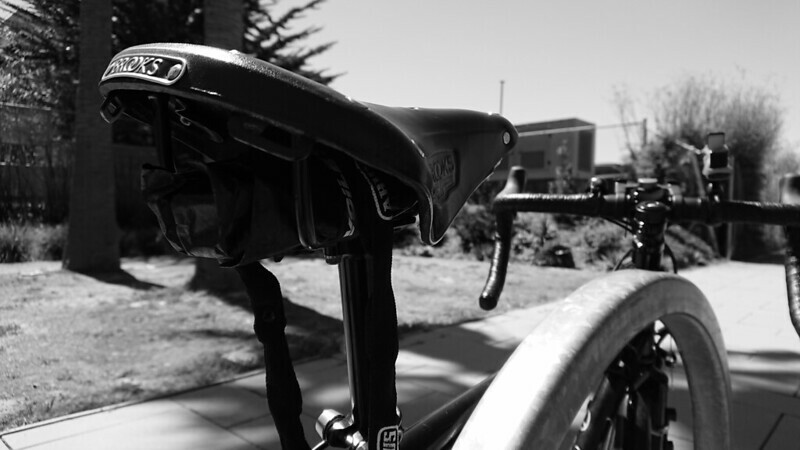 When I moved the spare tube from my pack to my bike, I wanted to avoid a noticeable bag like my Revelate Jerry Can. I’ve yet to have anyone steal this setup, but if they do, I’m only out $5 for the Voile strap, $8 for the tube, and a few pennies for the Tyvek. I can live with that. In the case of a tire blow out, I’ve wondered if a piece of the Tyvek could be cut, folded, and used as an emergency boot like a dollar bill. I have not had the opportunity to test this, because I buy good tires that don’t blow out. The repair kit I carry in my bag also contains a couple actual reifenflicken, more so because carrying them increases the opportunities that I have to say reifenflicken than because I feel I actually need them. This post was published on 2019-04-09 . It was tagged with bicycle, gear, edc. As a cyclist in San Francisco, one of the great challenges in life is how to carry all the burritos you’ll consume. The quality of a burrito as a fuel source is directly correlated to its slopiness. If placed directly into a backpack, it will inevitably leak through the imperfect foil wrapping and soil neighboring equipment. To solve this problem I revisited my DIY Tyvek Stuff Sacks from years past and created the Burrito Bag. The burrito is placed into the Burrito Bag for transport, containing any mess, which is later easily rinsed out. The Burrito Bag is constructed from black Tyvek I had from another project, rather than a USPS Priority Mail envelope. 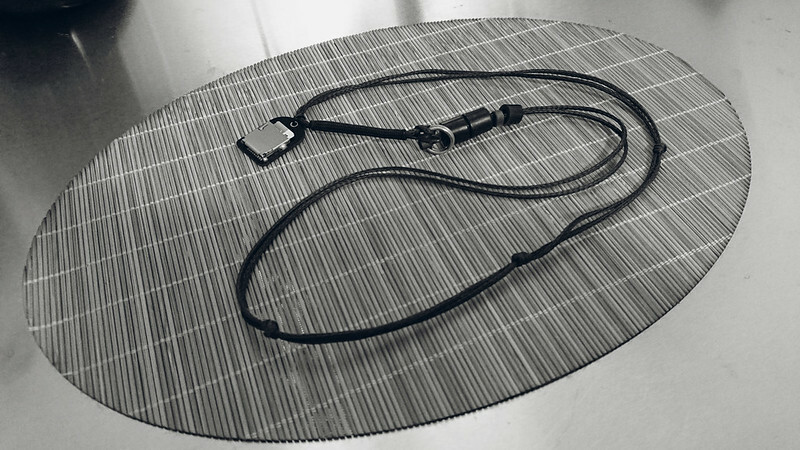 I cut out a piece 13” x 16”, folded it in half and used the awl from my Expedition Sewing Kit to close the bottom, side, and create a channel for a piece of Technora (because it’s cool) and cordlock to use as a cinch cord. The Burrito Bag is strategically engineered to contain dual burritos, or a single burrito with a generous side of chips. Actually it was patterned off of one of my original Tyvek stuff sacks, which I still use to contain my Trail Designs Ti-Tri cook system. It seemed like the right size for this application. 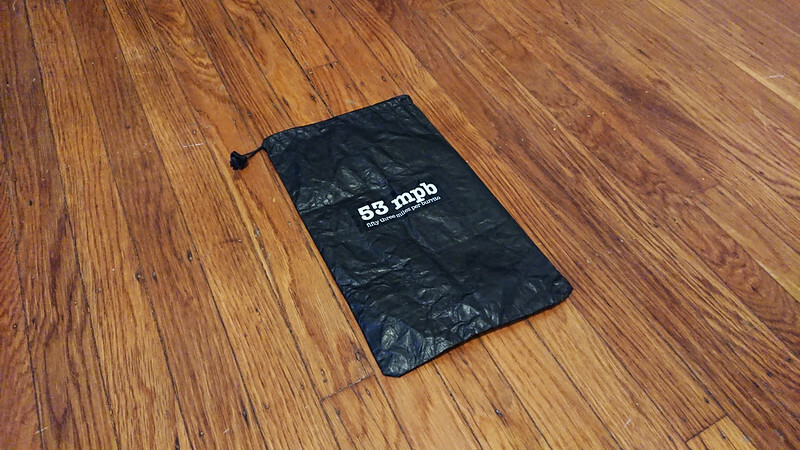 The Burrito Bag weighs in at 8 grams (0.3 oz), and when not in use folds down to a size smaller than that of the napkin you forgot to grab on your way out of the taqueria. The Burrito Bag is multipurpose. Despite its name, it is also capable of holding a shawarma wrap from the neighborhood Lebanese joint. I even once used it to takeaway a sushi roll. This post was published on 2019-03-03 . It was tagged with gear, edc. The size and durability of MicroSD cards make them an attractive option for carrying important data. In my experience they are unlikely to be damaged by incidental moisture, whether that be from rain, sweat or the occasional shower. But a single card is small enough that I always worry it will be lost, and it is susceptible to being snapped if carried inappropriately. The Digital Dogtag from N-O-D-E is one of the better solutions I’ve found for carrying a single MicroSD card. It uses a simple spring loaded socket to hold the card securely, and provides enough rigidity that I’m not worried about damaging the card. I added the dogtag to my current APEK iteration this past September and have been happy with the result. This post was published on 2018-12-05 . It was tagged with micro, gear, edc. Fix It Sticks are 1/4” magnetic bit drivers, originally intended as bicycle repair tools. Each stick holds two bits, and can be used individually or connected together in a “T” when more torque is wanted. I backed the Fix It Sticks Kickstarter campaign back in 2014, selecting the $99 pledge level for the titanium Fix It Sticks reward. For the past 4 years, the titanium Fix It Sticks have been part of my EDC. 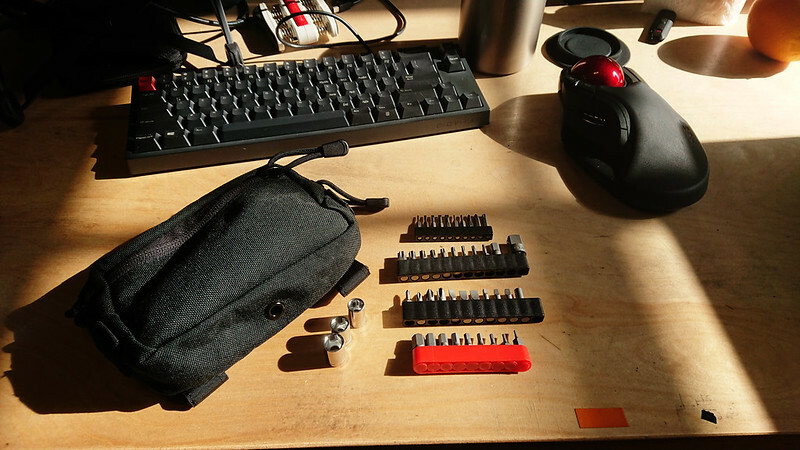 I carry them with a selection a bits optimized for bike repair, as well as a few supplemental bits that are not intended for my vehicle, but are useful to have on hand for general screwing. 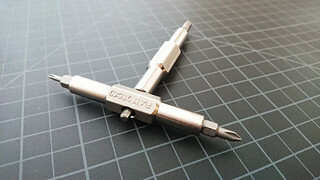 Extra bits are carried in a Toolcool bit holder. 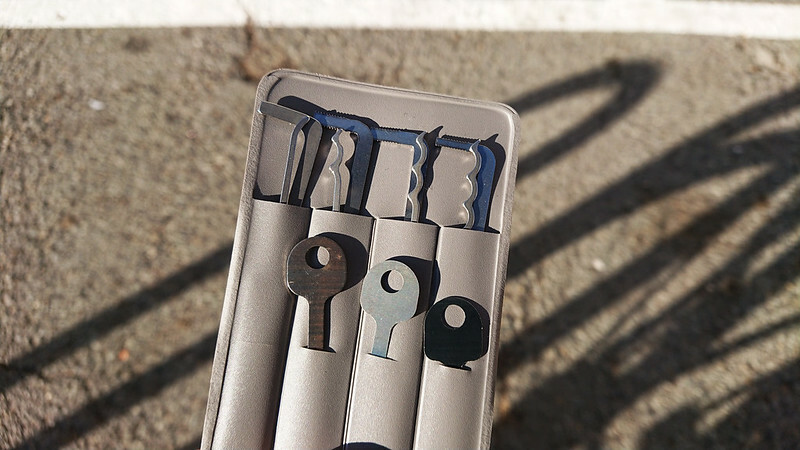 The sticks, bits, chain breaker, and tire levers – along with a patch kit and my Pitlock key – are stored in a small Mountain Laurel Designs Carbon Fiber Packing Cube. This lives in the admin pocket of my FAST Pack Litespeed, but also slides easily into a pocket if I’m riding bag-less. I also keep the new Fix It Sticks Magnetic Patch on my Litespeed. If I switch bits while fixing my bike on the side of the road, I can just toss a bit at my pack and the patch catches it. At home I have an excessive collection of 1/4” bits, including things like socket adapters, extensions, and the Fix It Sticks Glock kit. What’s most attractive about the bit and driver system to me is that these 80-some bits take up a miniscule fraction of the space that I would otherwise need for the tools. I keep a Wera Kraftofmr 816 RA driver at home for those times when I want something that ratchets, but the Fix It Sticks are what I pull out the vast majority of the time. At work I keep some additional bits, along with a few other tools, in a GPP1. Some of these duplicate my EDC bits, but most of them are things that are not common enough to warrant carrying, but common enough that I like to have them around. Carrying the “security” Torx instead of the standard Torx allows me to tamper with tamper-resistant electronics, which is a useful capability to have. They drive normal Torx bits screws just fine, which accounts for the majority of their use. 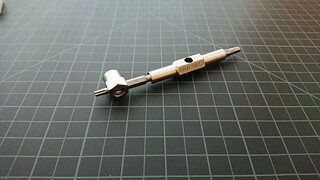 The T25 is a longer (50mm) bit. I use this one as leverage when operating my Pitlocks. The 1/4” to 4mm adapter allows me to run any 4mm micro bit in the Fix It Sticks. Part of the collection of bits in my GPP1 at work are micro bits that I use to attack electronics (at home I have the iFixit 64-bit Kit, which is a great hardware hacking kit for the price). A slotted 1.5mm bit is the right answer for most eyewear, which is why I carry that bit in the adapter every day. On my scale, a single titanium stick without bits weighs in at 28 grams. Both sticks, with the 4 bits that I keep in them, tip the scale at 74 grams. When I add the bracket with 12 additional bits, the total weight is 148 grams. Adding the chain tool and two tire lever attachments to that, the whole kit is 228 grams, or 8 ounces. That’s pretty reasonable for all the capability those items offer. Fix It Sticks only made a small number of the titanium sticks for the Kickstarter campaign. The sticks they sell today are steel. The weight of the steel Fix It Sticks Replaceable Edition is listed as 116 grams. I assume that weight is for both sticks and the 8 included bits. With my titanium sticks and the same 8 bits, I’m at 100 grams. So the titanium sticks shave off a little weight, but not really a notable amount – particularly considering that the titanium sticks were the reward for donations at 3x the cost of the steel sticks. I think my titanium sticks are perfect, and if offered I would purchase them again, but if they were lost I’d immediately replace them with the steel version with only a little heartbreak. This post was published on 2018-04-28 . 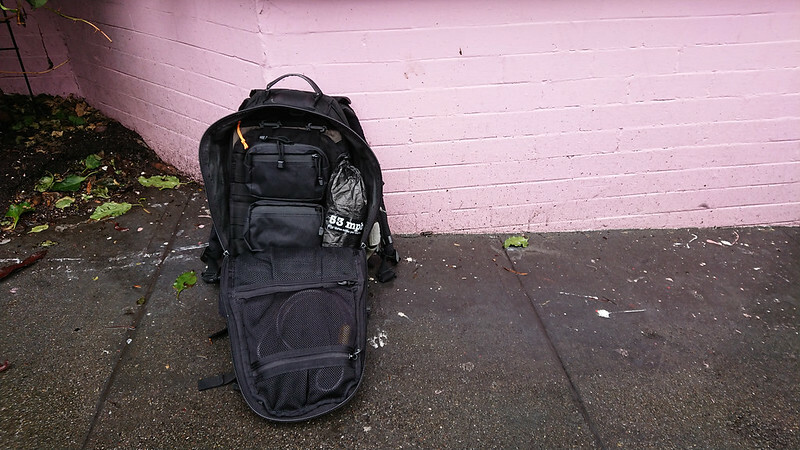 It was tagged with bicycle, gear, edc, repair. My dislike of the SWAT Tourniquet stems from its difficulty to self-apply one-handed. That eliminated it from the running when evaluating pocket tourniquets, but the PHLster Flatpack has made that category of tool less relevant. Now that I can easily and comfortably carry a primary tourniquet (specifically, a SOFTT-W) on-body, I’ve rethought what I should be carrying in my pack. In the past I’ve carried a SOFTT-W as part of a small blow-out kit. 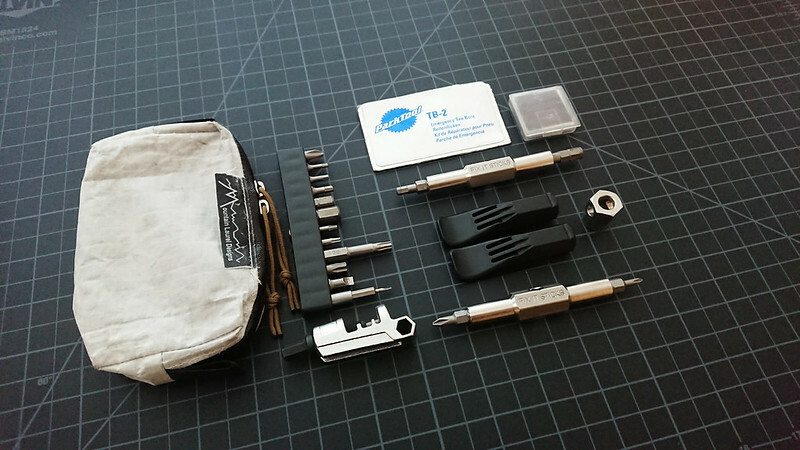 The kit is in a Triple Seven Gear Micro Kit pouch, which fits easily into whatever pack I’m using. If I’m already carrying a SOFTT-W on my belt, is carrying a second one the best use of the available weight and space? The SWAT tourniquet does have a few things going for it. It works well as a tourniquet, as long as you have two hands to apply it. The width of the SWAT-T allows it to occlude blood flow at a relatively low pressure, and its elasticity can help it to compensate for muscle relaxation. 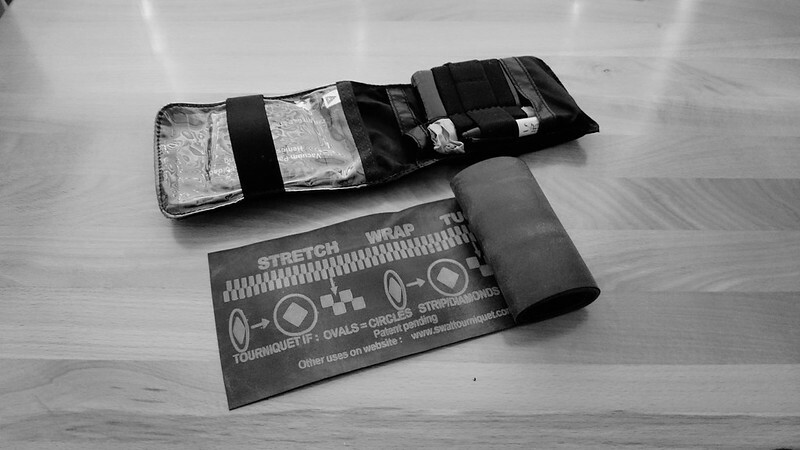 It can function as part of a pressure dressing, or be used to improve an improvised splint, swathe, or sling. And it burns well. 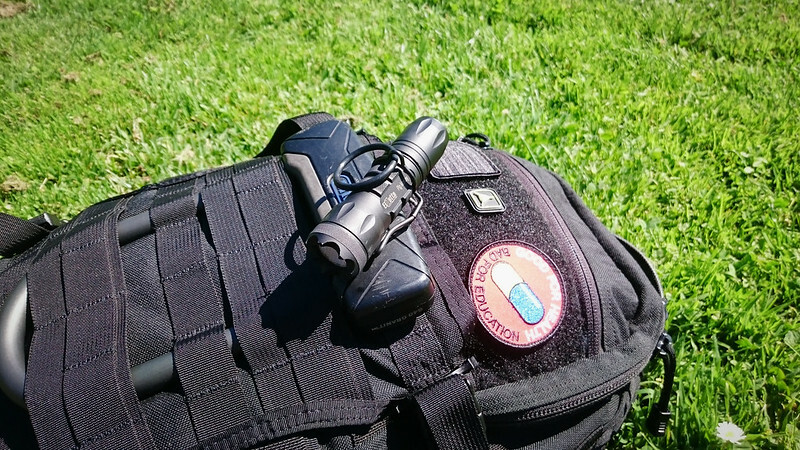 I decided to replace the SOFTT-W in my blow-out kit with a SWAT-T. With a SOFTT-W in the PHLster Flatpack on my belt, I’m confident in my ability to quickly administer self-aid. Having the SWAT-T in my bag gives me additional options, whether I need to use it as a second tourniquet or as something else. This post was published on 2016-08-13 . It was tagged with gear, medical, edc. I put a Raven Pocket Clip on my Elzetta Alpha. The Elzetta Alpha A323 has been part of my EDC for 2 years now. For all but a few weeks of that time I’ve been carrying it on my belt with a Prometheus Lights Titanium Pocket Clip, which works great on the Alpha. I changed over to the Raven Concealment Systems Pocket Clip to get the finger ring, which is just a large rubber O-ring that allows you to use your hands for something else without dropping the light. 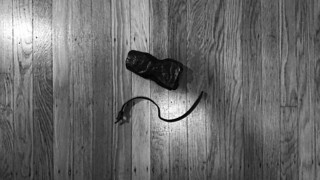 This post was published on 2016-08-07 . It was tagged with gear, micro, edc. I have a pretty thorough setup with my every day carry. Between the level 1 items on my body and the level 2 items in my pack, I have all the tools that I think I may need. This limits the need for a bug out bag in my environment. Were I packing a bag to support running away from a disaster, it would largely duplicate what I carry every day. The difference is in shelter. Specifically, clothing. For the past few years, I’ve kept a bug out stuff sack instead of a bug out bag. The stuff sack contains clothes, which gives me what I need to leave in a hurry regardless of what I’m currently wearing. I keep a pair of merino wool boxer briefs, merino wool long underwear, a lightweight merino wool long sleeve shirt, quick-drying nylon pants, a Buff, merino wool and nylon blend socks, and a cotton bandana. The two non-clothing items in the stuff sack are a Tru-Nord compass and a silk escape map. The map is from SplashMaps in the UK. It is a print of the OpenStreetMap for the San Francisco bay area at 1:40000 scale. Conspicuously absent from the contents of the stuff sack is any sort of foul-weather gear. I don’t venture outside without a hardshell jacket in my pack, even here in drought-stricken California. I also generally will have some sort of insulating layer already in my pack, making that an uncessary addition to the stuff sack. 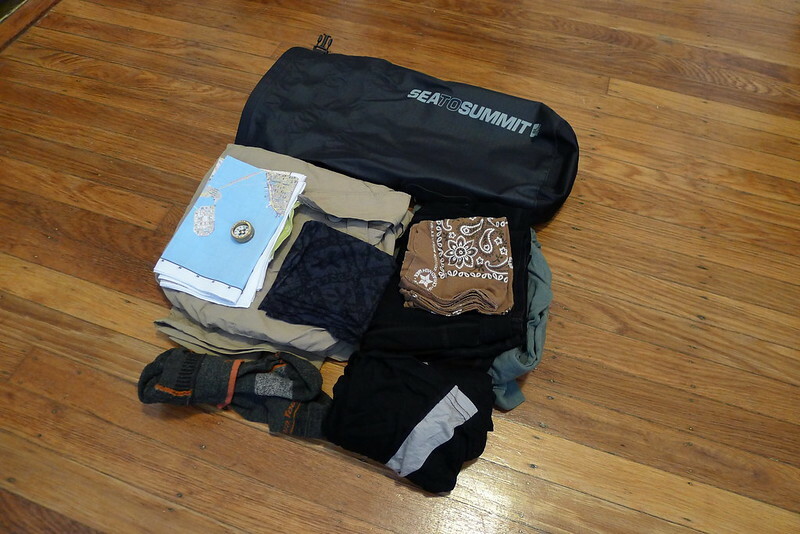 The stuff sack I went with is a Sea To Summit 8L Big River. This is a much heavier stuff sack than any of those I use backpacking. When I was deciding on the stuff sack for this project, I knew I wanted something that I would be comfortable running outside of a pack. The 420 denier nylon on the Big River is more abrasion resistant than any of my cuben or sil-nylon stuff sacks, and the Big River also includes Hypalon lash points on either side of the bag to assist when securing it. 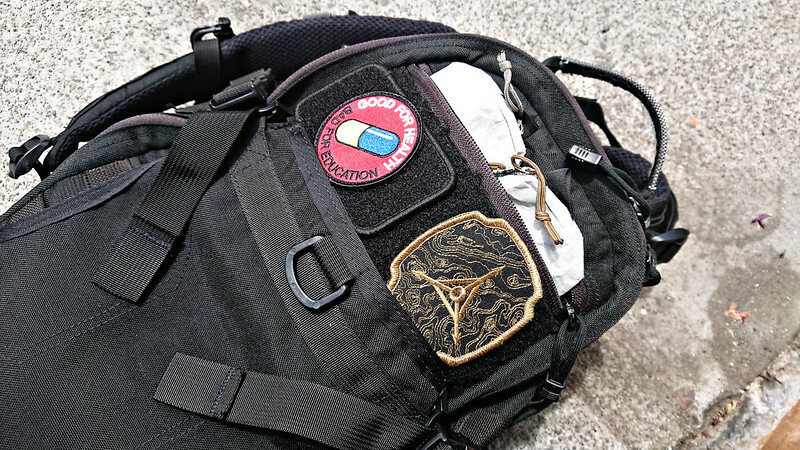 When I’m carrying a larger pack, like the FAST Pack EDC, these points are moot since I can just toss the stuff sack into the pack on the way out the door. However, if I’m using something smaller, like the FAST Pack Litespeed, the pack may already be close to full. With the Big River I’m able to quickly and easily lash the stuff sack to the bottom of the pack, without taking time rearranging the inside of the pack in an attempt to make more room. 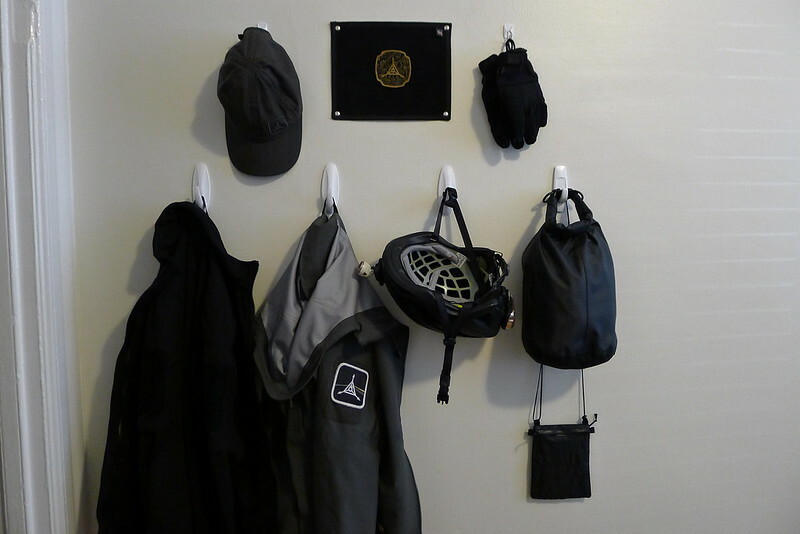 The stuff sack hangs on a hook on my wall, immediately next to the door. My pack and footwear stay underneath on the floor when I’m home. Keeping these items in the same spot means that I can grab them and be out the door in a short count of seconds. Also hanging in this area are my gloves and helmet, which are necessary when leaving on a bike (certainly the best bug out vehicle for a city). I also leave a hat, insulating jacket, and rain jacket hanging in this area. These items should already be in my pack, but leaving duplicates here allows me to easily grab them on my way out if needed. The last item in this area, hanging on the same hook as the stuff sack, is a small bag with documents that I may want when leaving in a hurry. I keep a stuff sack at my desk at work with all the same things in it. Since I only have one of the silk maps from SplashMaps, the stuff sack at work instead has a few USGS quads of the area printed on glow in the dark onion skin paper. I buy these from zdw on eBay. This post was published on 2016-04-16 . It was tagged with survival, edc.